Infrared radiationpanels are very effective for industrial processes where heat is required. One of the greatest advantage of IR heating is that there in startup time required. Because of this you can save a lot of time in compare with conventional dry- and heating systems during production starts. Liquefaction of hotmelt-glue. These are made of thermoplastic polymers which will become liquid above 100°C (212F), thereafter lose heat to the surface and then fasten to the surface. Drying of powder coating after it is applied by an electrostatic spraysystem on MDF or metal. IR drying has a great effect on gluing of difficult materials. For this you should think of materials that are under tension or have bended surfaces or edges. By the fast drying through the infrared the two materials will be better fastened to eachother. Because of the fast drying with infrared is makes infrared drying a very good solution for mass production. IR heating contributes to a larger efficiency and a higher production. Also the precision whereby the processes can be controlled gives a faster and better gluing. The result is a better production quality and less product risk and product waste. Jac. 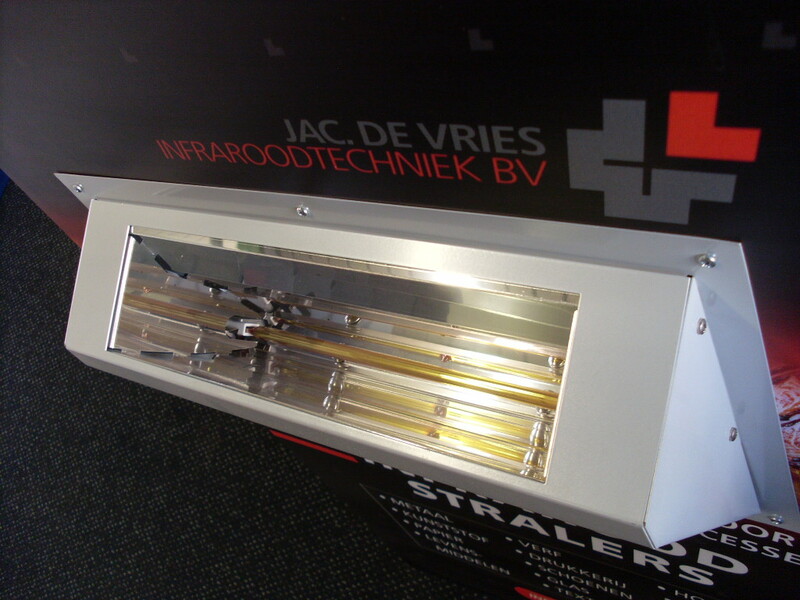 de Vries Infraroodtechniek has realized for many industrial applications custom made solutions with IR drysystems, completely designed for to the properties of products and production processe. We personal advise you for each process which IR dryer / wavelength is the most effective for your application. So we will always offer you a system that uses the lowest energy to do the job. Test Installations for more certaintly! Are you looking for more certaintly that IR drying or heating is the sollution for your dry problem, than we offer you the possibility to rent an IR dry system for a few weeks. In this way you are able to run production with IR, get some experience with it and find out for yourself if it is the answer to your problem. If you want more information about infrared drying from Jac. de Vries, please look on our downloadpages for leaflets or ask your question by our contactform.